Llongyfarchiadau to all our graduates on their nominations and wins for BAFTA Cymru 2018! Eve Myles, Sian Jenkins and Amy Wadge, were not only all studying at the College at the same time in the 1990’s, but all won for their categories on the night. 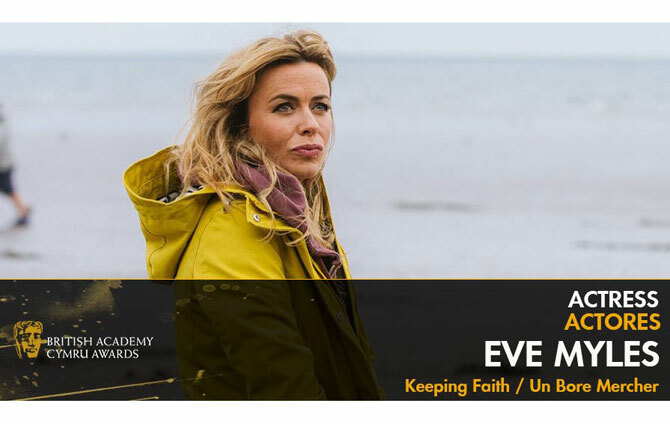 Eve Myles, who was up against fellow graduate Annes Elwy for Best Actress, won for Keeping Faith/Un Bore Mercher, which swept the awards board: Amy Wadge won for its best original music, which her friend Eve asked her to write, and Mark Lewis Jones was nominated for Best Actor. Sian Jenkins was awarded her BAFTA Cymru for best Costume Design for Requiem. Bang, which featured many College graduates including Jacob Ifan and Catrin Stewart, Rebecca Hayes, Matthew Aubrey and Chris Reilly, and was produced by arts management and stage management graduate Catrin Lewis Defis, won the Best Television Drama. Chris Reilly has also just won the BAFTA Scotland Best Actor award for The Last Post. “Collectively the Colleges graduate success at the 2018 Bafta Cymru awards has endorsed the importance to us of the Welsh Television Industry,” said Sean Crowley, the College’s Director of Drama.